The winner of the Crack Hair Styling Treatment is Andi! Congratulations to her and thanks to all who entered. Here's a preview of what Revlon has lined up for their Fall polish line, and they look fabulous! Eva Chen, editor of Teen Vogue posted these on her Tumblr blog and you can read more about them here. 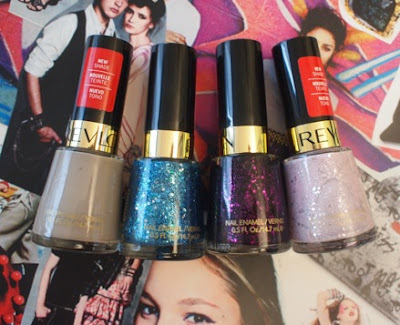 You can read more about the entire Revlon Fall line from beautyhigh.com. The lilac one on the end with the glitter in it looks nice, and I wonder how the blue one compares to Deb. Lippman's Lady Sings The Blues? :D Thanks for the photo! Oh my, Revlon has really been stepping it up lately. I think I might need all four of those. Ooooh! Pretty! I will be keeping my eyeballs peeled for these. Congratulations to the winner! and i am loving the glittery blue one. That purple glitter looks AMAZING! The purple glitter reminds me of Deborah Lippmann's Bad Romance :o But I like the ones to the left and right of the purple glitter one :) Hope I could find these! Oooh! Those are so pretty! I like the way the last 3 look in the bottle. Look very promising. Thanks for posting this, they look STUNNING!!! Yes that purple does look like a Bad Romance dupe! I especially like the last three!